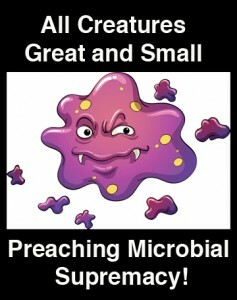 Microbiology Blog of the Day: All Creatures Great AND Small: Preaching Microbial Supremacy! – microBEnet: the microbiology of the Built Environment network. home Around the blogosphere, Microbiology blog of the day Microbiology Blog of the Day: All Creatures Great AND Small: Preaching Microbial Supremacy! Going through the list of Microbiology Blogs I have curated at microBEnet and going to try to feature one of the every day or so. And just going to do this alphabetically. Today’s blog: All Creatures Great AND Small: Preaching Microbial Supremacy!. Tagline: Ruminations on the teaching of and research in microbiology at a small liberal arts undergraduate institution. Student-Centered Learning, Part I: Nanobiographies! Comments: I love this blog. And Mark Martin is one of the true heroes of microbiology education. He always has something interesting to say. Dear Jon: I’m very touched. I appreciate the shout-out. I’ll keep posting. And I’m honored to be a “Hero of Microbiology” in any way!